On Arduino Day, we announced the latest member of the Arduino MKR family: the MKRFOX1200. 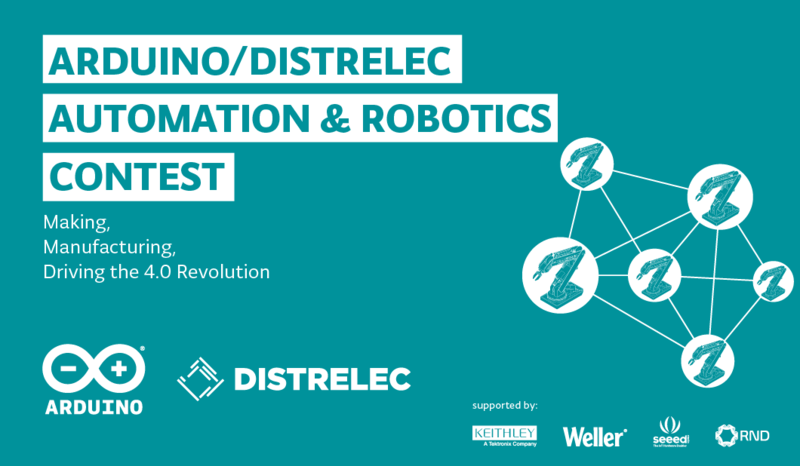 This powerful IoT development board offers a practical and cost effective solution for Makers looking to add Sigfox connectivity to their projects with minimal previous networking experience. The MKRFOX1200 shares several similarities with other MKR products, like the MKR1000 and MKRZero, including a compact form factor (67 x 25mm) and a Microchip SAM D21 32-bit Cortex-M0+ microcontroller at its core. The recently unveiled board also features an ATA8520 module for long-range, low-energy consumption, and is capable of running for over six months on two standard AA 1.5V batteries. 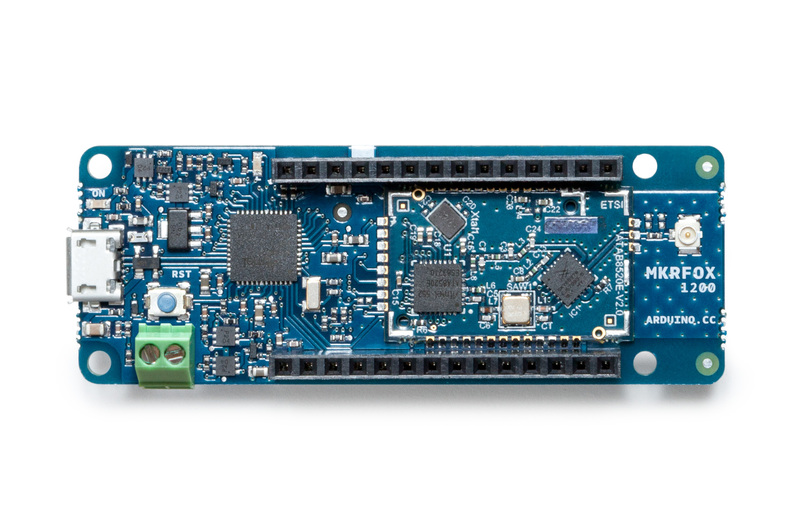 Designed for Makers ready to take their IoT projects into the real world, the MKRFOX1200 comes with a GSM antenna that can be attached to the board and a two-year subscription to the Sigfox network. This provides users with full access to Sigfox’s efficient messaging system (up to 140 messages per day), cloud platform, webhooks, APIs, as well as the new Spot’it geolocation service. MKRFOX1200 can be used in a wide variety of settings, from agriculture (livestock management, smart irrigation and weather stations), to smart cities (dumpster monitoring, air quality networks, street lighting or parking lot tracking), to utility metering and other industrial applications. Sigfox currently operates in over 30 countries, with more to follow in the next few years. (Use this map to see whether it has been deployed or is rolling out in your area.) The first version of the MKRFOX1200 is compatible with Sigfox Radio Configuration Zone 1 (868MHz, 14dBm), meaning it is only supported in network-covered regions of Europe, the Middle East, and South Africa. 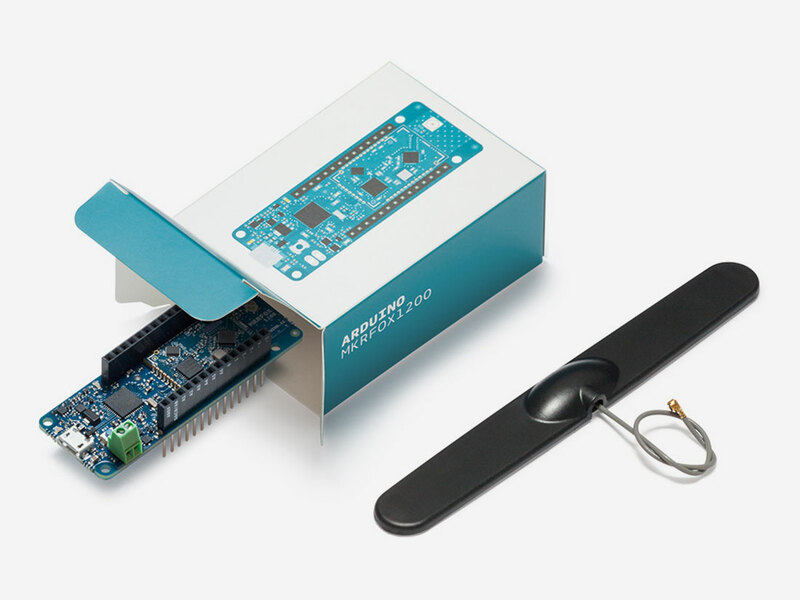 The board is now available on Arduino’s European online store! The project itself is very simple: getting push notifications via MQTT when a wireless doorbell sounds. But as [Robin Reiter] points out, as the “Hello, world!” program is a time-honored tradition for coders new to a language, so too is his project very much the hardware embodiment of the same tradition. And the accompanying video build log below is a whirlwind tour that will get the first-timer off the ground and on the way to MQTT glory. The hardware [Robin] chose for this primer is pretty basic – a wireless doorbell consisting of a battery-powered button and a plug-in receiver that tootles melodiously when you’ve got a visitor. [Robin] engages in a teardown of the receiver with attempted reverse engineering, but he wisely chose the path of least resistance and settled on monitoring the LEDs that flash when the button is pushed. An RFduino was selected from [Robin]’s ridiculously well-organized parts bin and wired up for the job. The ‘duino-fied doorbell talks Bluetooth to an MQTT broker on a Raspberry Pi, which also handles push notifications to his phone. The meat of the build log, though, is the details of setting up MQTT. We’ve posted a lot about MQTT, including [Elliot Williams]’ great series on the subject. But this tutorial is very nuts and bolts, the kind of thing you can just follow along with, pause the video once in a while, and have a working system up and running quickly. There’s a lot here for the beginner, and even the old hands will pick up a tip or two. IoT, web apps, and connected devices are all becoming increasingly popular. But, the market still resembles a wild west apothecary, and no single IoT ecosystem or architecture seems to be the one bottle of snake oil we’ll all end up using. As such, we hackers are keen to build our own devices, instead of risking being locked into an IoT system that could become obsolete at any time. But, building an IoT device and interface takes a wide range of skills, and those who are lacking skill in the dark art of programming might have trouble creating a control app for their shiny new connected-thing. Enter Involt, which is a framework for building hardware control interfaces using HTML and CSS. The framework is built on Node-Webkit, which means the conventions should be familiar to those with a bit of web development background. Hardware interactions (on Arduinos) are handled with simple CSS classes. For example, a button might contain a CSS class which changes an Arduino pin from high to low. While Involt isn’t the only framework to simplify hardware interaction (it’s not even the only Node.js based method), the simplicity is definitely laudable. For those who are just getting started with these sorts of devices, Involt can absolutely make the process faster and less painful. And, even for those who are experienced in this arena, the speed and efficiency of prototyping with Involt is sure to be useful. [Carbonette] has also provided some external resources on various aspects of the project for those seeking greater depth and ideas for expanding beyond. Next thing you know you’ll be summoning Ubers and finding your misplaced phone. Scrolling LED signs were pretty keen back in the day, and now they’re pretty easy to come by on the cheap. Getting a signboard configured for IoT duty can be tricky, but as [kripthor] shows us, it’s not that bad as long as security isn’t your top concern and you can tweak a serial interface. [kripthor] chanced upon an Amplus AM03127 signboard that hails from the days when tri-color LEDs were the big thing. The unit came with a defunct remote thanks to leaking batteries, but a built-in serial interface offered a way to connect. Unfortunately, the RS-232 standard on the signboard wants both positive and negative voltages with respect to ground to represent the 1s and 0s, and that wouldn’t work with the ESP8266 [kripthor] was targeting. The ubiquitous MAX-232 transceiver was enlisted to convert logic levels to RS-232 signals and a small buck converter was added to power the ESP. A little scripting and the signboard is online and ready for use and abuse by the interwebz — [kripthor] says he’ll regret this, but we’re pleased with the way the first remote access turned out. Feel free to check out the live video feed and see what the current message is. Personally, we don’t have much use for a signboard, but getting RS-232 devices working in the Arduino ecosystem is definitely a trick we’ll keep in mind. If asynchronous serial protocols aren’t your strong suit, you might want to check out this guide to what can go wrong by our own [Elliot Williams]. Waiting For A Letter? This IoT Mailbox Will Tell You Exactly When It Arrives. If you’re waiting for a much sought-after letter, checking your mailbox every five minutes can be a roller-coaster of emotion — not to mention time-consuming. If you fall into this trap, Hackaday.io user [CuriosityGym] as whipped up a mailbox that will send off an email once the snail-mail arrives. The project uses an Arduino Uno, an ESP 8266 wifi module, and an idIoTware shield board — making specific use of its RGB LED and light dependent resistor(LDR). Configuring the RGB LED on the idIoTware board to a steady white light sets the baseline for the LDR, and when a letter is dropped in the box, the change in brightness is registered by the LDR, triggering the Arduino to send off the email. They used a service called IFTTT — If This Then That — to set up the email process, but feel free to use whatever is most comfortable for you. Be sure to insulate your board properly if you have a metal mailbox! Or, forego the standard letter receptacle and build the smartest mailbox you may ever see. You are currently browsing the archives for the iot category.